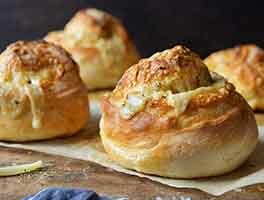 These golden, high-rising rolls are buttery and delicious, their texture a comforting cross between tender biscuit and soft dinner roll. 2 hrs 33 mins. to 2 hrs 45 mins. Place the flour or flour blend, Hi-maize, cake enhancer, instant yeast, salt, and xanthan gum in a mixing bowl, and whisk to combine. Using an electric mixer (hand mixer, or stand), mix together the milk, eggs, and honey. Beat in 1 cup of the flour mixture, and the 2 tablespoons soft butter. Beat in the remaining dry ingredients; scrape the bottom and sides of the bowl, then beat at high speed for 3 minutes, to make a smooth, thick batter. Cover the bowl, and let the thick batter rise for 1 hour. It won't appear to do much; that's OK.
Scrape down the bottom and sides of the bowl, deflating the batter in the process. Grease an 8" round pan; or 6 English muffin rings; or the wells of a hamburger bun pan. Grease a muffin scoop or large spoon with the melted butter, or with non-stick baking spray. Scoop the dough into the 8" round pan; a slightly overfilled muffin scoop works well here. Space 7 mounds around the perimeter, and 1 in the middle. To make sandwich buns, drop the batter into the prepared hamburger bun pan, or into the English muffin rings placed onto a greased or parchment-lined baking sheet. 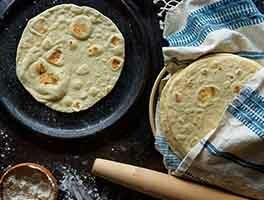 Flatten the dough slightly, using a greased spatula or your wet fingers. Cover with greased plastic wrap, and set in a warm place to rise until the rolls touch each other and look puffy. This should take about 45 to 60 minutes. Towards the end of the rising time, preheat the oven to 350°F. Bake the rolls for 28 to 32 minutes, until they're golden brown. Remove the rolls from the oven, let them cool in the pan for 10 minutes, then turn them out of the pan onto a rack. Serve warm. No Hi-maize? 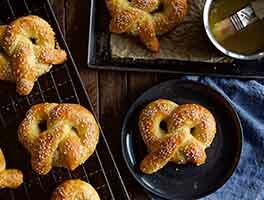 Substitute 1/4 cup King Arthur Gluten-Free Flour or brown rice flour blend. This was the first King Arthur recipe that I was not crazy about, partially my own fault. They said it was a mixture between a biscuit and a dinner roll, but I would consider these to be very dense biscuits. I was really wanting a soft yeasted dinner roll. When I made the dough it seemed a little dry, so I wondered if I should have added more liquid. In the end of the product was dry too. They were still edible, but it's just not what I was looking for. Alma below should try KAF's Amish Dinner Roll recipe and substitute gluten free flour for the wheat flour. The mashed potatoes give it a soft density that stands up so well to hamburgers and sandwiches. 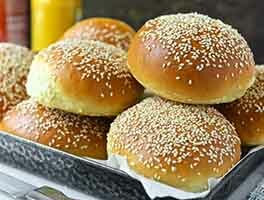 If you make 16 rolls out of the batch of dough they are the perfect size for hamburgers. Bake them 2' apart on a cookie sheet. My family loves them. My quest for a gluten free hamburger roll continues. Made these for dinner last night, not pleased with them. They really are more a dinner roll than a ham bun. I do all my measuring using a digital scale. Followed the recipe exactly. They were heavy and crumbly. I gave 3 stars because they went together very easily. 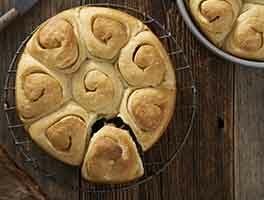 Definitely the best of a half-dozen gluten free roll recipes I have tried. I substituted King Arthur Potato Starch for the Hi-Maize Fiber, which I did not have on hand. Based on other tester's comments, I also increased the yeast by 1/4 tsp. I did not use the Cake Enhancer, but followed the rest of the recipe as printed. The flavor was quite good, and the rolls were tender...however the texture was still closer to a biscuit versus a light and fluffy yeast roll. I also pulled them at 22 minutes, which was perfect. Will definitely make again. I used a round pan for baking, but in the future I am going to try the recipe in the hamburger bun pan. My gluten-free Easter guests enjoyed these rolls very much, and my GF grandson asked to have another roll for dessert! I made this recipe last night for thanksgiving, where I was the only one who is gluten free. I subbed the high maize flour for more gf flour,, and didn't use the cake enhancer, but WOW these rolls were amazing!!!!!! I also used lactose free skim milk, and subbed the honey for brown sugar (additional dietary restrictions of mine). EVERYONE complimented the rolls, and my 11 year old picky eater cousin even asked for the recipe. People were visibly shocked when I told them the rolls were gluten free!!!! I've now been gluten free for 7 months, and can honestly say this is the best bread recipe I've tried (and I live in NYC--home of gf bakeries). You'd never know they were gluten free!! 5/5 would recommend and make again! I didnt have hi maize so used a total of 9 1/4 oz. KA gf flour. The texture was more biscuit-like. My daughter liked them. I did notice the next day they were hard but she split and toasted them to eat. 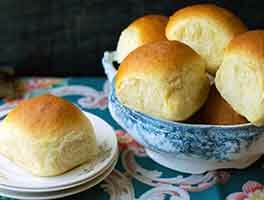 Would like to find gf roll more like KA's Amish potato roll texture, although thats asking a lot as they are very soft and feathery in texture which I realize is going to be hard if not impossible to dupicate in a gf roll. These were easy and taste great! I subbed corn flour for the hi maize and did not use the cake enhancer. They did have a slight cornbread taste to them from the addition of the corn flour, but my daughter said the flavor and texture were the closest she's come to "real bread" in a long time. They also freeze well, she's been reheating them to use for burgers and sandwiches. Can't wait to try them again with the hi maize. Delicious! Still more biscuit than dinner roll, but closer than usual! No grittiness with the KAF flour and hi-maize fiber. Wow. These were fantastic. My gluten-eating friends said if I hadn't told them they wouldn't have realized these rolls were gluten free. I used my own flour blend (brown rice, tapioca starch, potato starch) and instead of the fiber I added the same amount of flour mix. They were fluffy and had a lovely crumb and flavor. I'm definitely taking these to my in-laws for the holidays. I've always been the one to bring rolls to the holiday dinners because no one else can make them. For the last 3 years (since I was diagnosed with gluten sensitivity) I've had to watch while everyone else had lovely, buttery gluten filled rolls that I made. No more! I may just make all gluten free rolls this year and not tell anybody. Ha! The best rolls, GF or not! I substituted corn fiber for an extra 1/4 cup of flour (I used KAF GF flour) and coconut oil spread and unsweetened almond milk for butter and milk to make it dairy free, topped with more melted coconut spread and chopped fresh herbs. Even though it required some time to make, it was very easy and surely worth it. I can't wait to make it again!